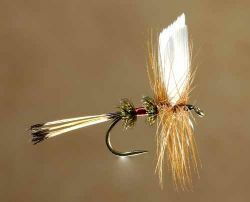 Not long after I took up fly fishing, as a teenager, I began to look upon those who fished the Royal Coachman and Parmachene Belle and other such garish and unnatural flies as...well, gullible. I unconsciously counted myself among the new breed of fly fishers who understood that trout eat insects and crustaceans and tiny fishes and that flies should imitate these creatures in look and movement at all times. When I'd hear chatter about the magic of red floss and peacock herl in the Royal Coachman dry fly I'd just smile a sympathetic smile of wisdom. Oh poor, ignorant fools, I'd think. Now I think differently. Now I think, Oh what a poor, ignorant fool was I. All right, maybe the mystical qualities attributed to the fanciful trout fly got a bit carried away back in mid-century America. Now, with almost forty year's fly-fishing experience behind me, I know that trout can come anxiously to even some absurd fly patterns while ignoring every sort of imitative fly. And I also know that during such times trout may demand a particular absurd pattern. Does it make sense? Not at all. But it happens with fair regularity. Understanding trout is no easier, I've found, than understanding people, and neither subject's behavior is particularly logical. So you'd better keep an open mind and a few proven-effective "attractor" flies, flies that imitate nothing in particular, in your boxes and in the back of your mind. To find out more about the popular big attractor dry flies used today, and how to fish them, read on in Bring the Big Attractor Dry Flies, Part Two.